Do you think you have what it takes to be an entrepreneur? Heroes and great thinkers have said it over and over again: the youth is the future of every nation. And that is exactly what we believe in too, here at Entrepreneur Philippines. Over the years, the concept of entrepreneurship has been spreading like a virus among the youth of today. More and more schools are even offering courses on entrepreneurship that will help prepare these students to be the bosses of their own businesses after graduation and not to be part of the fresh crop of graduates seeking employment. To encourage more students to tap their entrepreneurial talents, Entrepreneur Philippines is staging the Entrepreneur Student Challenge 2011. 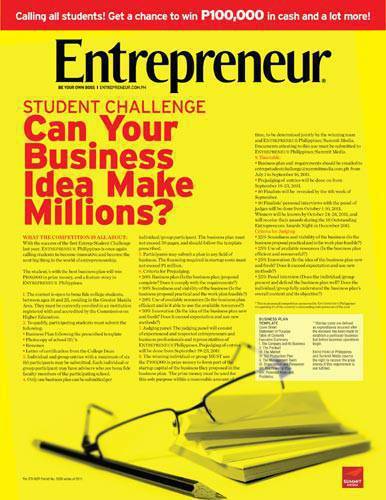 Open to students in Metro Manila, the Entrepreneur Student Challenge will give the winning team a P100,000 cash prize. For more information about the contest, please click on the image below.